EPOCHAL is a company having been founded and run by a group of mothers in the child-rearing years in Japan. We are Japan’s sole brand specializing in anti-UV (ultraviolet rays) apparel products that was established by the mothers, originally for the sake of their young children who were diagnosed in part as having atopic skin conditions. Our clothes capable of blocking UV that have been designed to enable children to play outdoors cheerfully are being created using special textiles manufactured by Japan’s leading fabric makers. The EPOCHAL brand’s quality standards are remarkably high: It’s UV-reduction rates are more than 91 percent with the fabric having been carefully selected to ensure that our products are not only comfortable to touch but also excellent in sweat-absorbent and quick-drying properties. What EPOCHAL’s designing department places especially high importance on is to produce apparel gear items having advanced easy-to-wear functionality. We consider it highly important to accomplish the task of creating a “superb design” capable of both protecting the portions of skin that are prone to get sunburned and making you able to spend time in a pleasant way during the hot, humid season. Summer in Japan is sweltering, while various facets of our environment are being subject to impacts of the global warming and climate change. A single item of EPOCHAL clothing can materialize the objectives of avoiding the sun in summer that is blazing on our skin, as well as allowing air to pass through easily and drying sweat as quickly as possible. Apparel items of EPOCHAL have combined high-quality and reassurance traits to be capable of keeping up their UV-blocking effects even after being washed repeatedly, because of our usage of special fabrics. The EPOCHAL brand, which commenced with making a single piece of outer wear for a baby, is now proud of the depth of its product lineup, comprising about 500 items that are nicely in line with preferences of all generations of men and women. 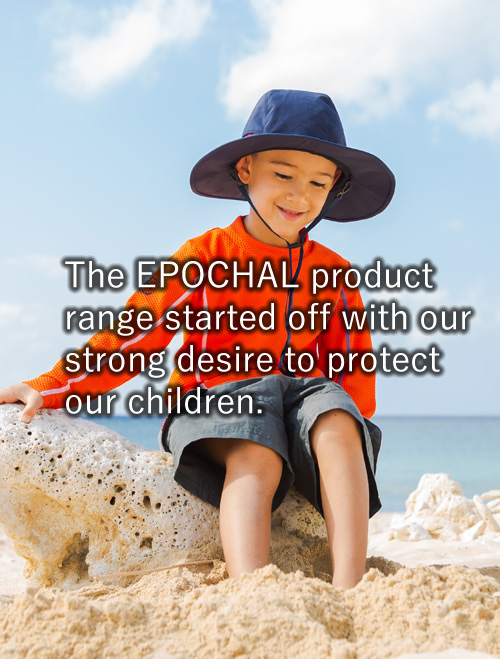 EPOCHAL has been continuously turning out a wide variety of wear, based on a viewpoint of “preventive medicine” for the benefit of people whose skin is sensitive and those who are concerned about skin conditions such as photosensitivity and atopy, and all people who are aspiring after beautiful and healthy conditions of skin and body for life.